Plants as living things need food / nutrients to live and breed. Plants get food, especially of mineral reserves in the soil contained in organic materials, organic wastes, nitrogen-fixing bacteria, sediment through the air, etc. Nutrients derived from land plants are converted into carbohydrates through photosynthesis process of plants. The availability of food plants is influenced by soil fertility. Soil fertility is the ability of soil to provide nutrients in sufficient quantities to support growth and proliferation. This definition is often understood too narrowly by only considering the nature of the chemical / soil fertility which concerns only the number and availability of nutrients contained in soil. The concept of soil fertility is actually much broader. Aspect soil fertility is the physical properties of soil, soil density, soil structure and porosity / estrangement soil / water absorbing capability. 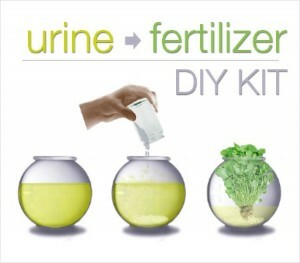 To get the fertility of the soil is required the addition of materials containing nutrients. Organic nutrients can be obtained from the fermentation of cow urine. Cow (Bison benasus L) is a large ruminant which has many benefits both to humans or plants, such as meat, milk, leather, power and dirt. 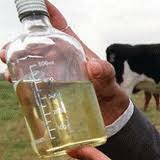 In addition, Urine cows (Bison benasus L) can be made liquid fertilizer as a pesticide for crops. Liquid manure from cow urine (Bison benasus L) is very easy and does not take long and good for the plants compared with artificial fertilizer factory. The materials used to make liquid fertilizer are also easily available and relatively low cost. Galangal, turmeric, Intersection ireng, ginger, kencur, brotowali pounded and then put in a plastic drum. The addition of materials to eliminate odors and provide a sense of cow urine undesirable for pests. After that, molasses is inserted into a plastic drum, then put the starter Sacharomyces cereviceae. Molasses and starter Sacharomyces cereviceae is useful for fermentation of and later once be liquid fertilizer can increase the number of beneficial microbes that exist in the soil. Fermentation of cow urine settling for 14 days and stirred every day. Plastic drum is closed by napkins cloth or paper. Finally, After 14 days of liquid manure is filtered and packaged. Cow urine often causes environmental problems because it creates unpleasant odors. However, after the touch of a fermentation of technology in the form fermentation cow urine can be used as organic fertilizer. Fertilizer is very good to return of soil fertility. With fermentation cow urine is the use of chemical fertilizers can be reduced by up to 50% for the first phase, and the next stage of use of chemical fertilizers can be reduced even more. 0 Response to "Cow Urine Fermentation (Bison bonasus L) as Fertilizer Liquid"